Description: Shell minute, spire moderately elevated. Protoconch moderately elevated, smooth, with well-defined transition to teleoconch. 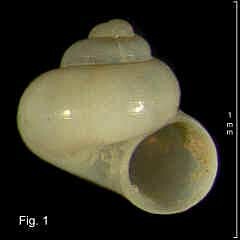 Teleoconch up to 2½ whorls. Whorls rounded, smooth except for irregular growth lines. Umbilicus open, deep, partly closed by inner lip of aperture, with 2 or 3 spiral ribs commencing at apertural lip and descending into umbilicus. Aperture circular, peristome entire or nearly so, outer lip thin, inner lip a little thickened and reflected over umbilicus. Shell colourless transparent when fresh, becoming opaque white with age. Size: Up to 1.3 mm high. Distribution: Endemic to Australia; Yamba, NSW, southwards and around southern Australia to South Australia, including Tasmania. Habitat: Known from beach washup, and down to 183 m. Moderately common. 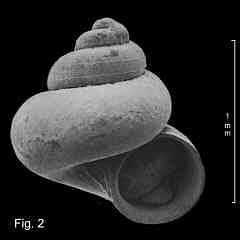 Comparison: This is similar in shape to Brookula angeli, but is not as tall, and lacks the sculpture of that species. Remarks: Warén (1992) figured the shell (reproduced here as Fig. 2), umbilicus and protoconch of a possible syntype. Fig.1: 12 km E of Cakoro Point, S of Yamba, NSW, in 55 m (C.218293). Sculpture within the umbilicus is present but not clear in the photo.